Dallas Police Chief Renee Hall speaks at a press conference. After a chase, police arrested the man suspected of shooting two Dallas police officers and a Home Depot guard. The three shooting victims were 'out of surgery' late Tuesday. Update, 10: 30 p.m. Armando Luis Juarez, 29, will be charged in the shooting of two Dallas police officers and a loss prevention employee at a Home Depot in Lake Highlands on Tuesday. All three shooting victims were “out of surgery” Tuesday night, Dallas Police Chief U. Reneé Hall told reporters outside Texas Health Presbyterian. No other details were given on their conditions. Juarez, who Hall said was also the subject of an outstanding warrant for a felony theft charge, was arrested following an hourslong manhunt and a high-speed car chase. Police had been looking for a white pickup truck, which officers spotted in southeast Dallas on Tuesday night, Hall said. The truck fled, and dozens of police cars joined in a chase that went through downtown before ending in Oak Lawn. Juarez was arrested, along with a woman passenger that police did not immediately name. Juarez was being questioned and moved to the Dallas County Jail late Tuesday. For now, he faces several counts of charges of aggravated assault of a police officer, Hall said. Hall and Mayor Mike Rawlings commended the work of Dallas police and asked for prayers for the hospitalized officers. Update, 9:20 p.m.: Following an hourslong manhunt that ended in a high-speed car chase, police arrested the man suspected of shooting two Dallas police officers Tuesday. The police pursuit of a pickup truck, which matched the one authorities spent much of the evening searching for, crossed through downtown Dallas before the driver stopped near Versailles and Lemmon avenues in Oak Lawn. He was taken into custody shortly after 9 p.m.
Dallas police are searching for a person of interest believed to have been involved in the shooting of two police officers and a loss prevention employee at a Home Depot in Lake Highlands. During a press conference, Chief Reneé Hall said the two officers had been critically wounded and were being treated at Texas Health Presbyterian Hospital. She declined to say anything further about their health status out of respect to their families. 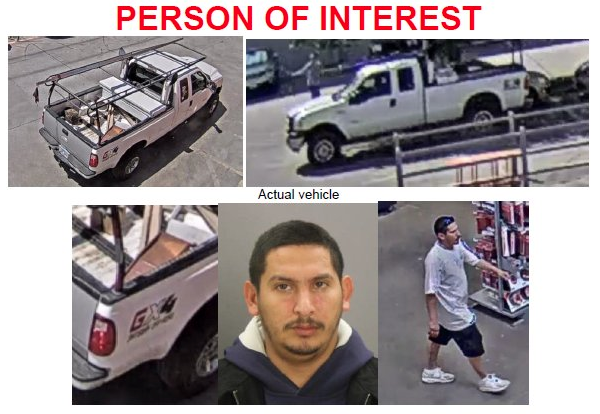 The person of interest is 29-year-old Armando Luis Juarez, whom Hall said “possibly” fled the scene in a white, extended cab pickup truck. Police were called to the Home Depot at 4:12 p.m. by an off-duty Dallas officer who was at the store. Two officers responded. Shortly thereafter, Hall said, police received another call for assistance—the two responding officers had been shot, as well as the loss prevention employee. Around 4:15 p.m., police cars and SWAT vehicles were spotted speeding north on Central Expressway, along the shoulder to bypass traffic. In the press conference, Mayor Mike Rawlings called the news a “very cursory update” and declined to give the status of any of the victims out of respect for the families. Hall said the family of one of the police officers had not yet arrived at Presbyterian. Rawlings said the department was unlikely to hold another press conference “unless there’s some big breaking news that we need to do face-to-face.” He promised to keep the public updated and carried a solemn tone. “Once again, Dallas is at the precipice looking into the hell of heartbreak as our police department was attacked this afternoon,” he said.